At Stokely Event Center, it’s always party time, but even for us, this is a special time of year. It’s Holiday party time! We love helping people create fun & memorable times together. 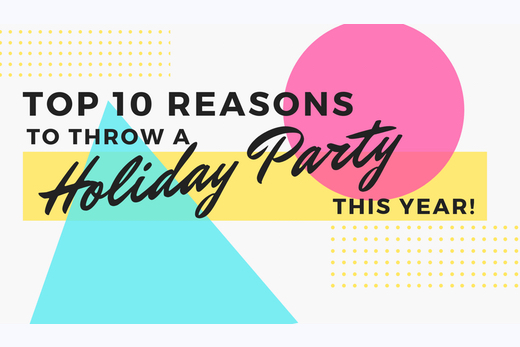 Here are our top 10 reasons to throw a holiday party this year! If you’re the leader of an organization, these first 5 reasons are just for you. You may spend all your time thinking about the more “serious” tasks at hand. But remember, you and your team are just people, and people need to relax and have fun. The good news is that the holidays are the perfect excuse to take time to do just that. Happy employees work better and stay longer. The effort you put into planning your holiday parties will come back to you in productivity. There’s no better way to build company morale than spending a great evening of fun together as an organization. Holiday parties offer the perfect opportunity for team-building activities. The party atmosphere naturally helps people let down their guards. Plan some fun activities with a holiday theme. The relaxed tone of the evening will help team members to bond more easily and effectively. The holidays can be an excellent opportunity to build client relationships as well. They will appreciate getting to know you and your team on a more casual level. In addition, you can gain a better understanding of them and get to know them better. As a leader, you may think you know a lot about your team members. However, seeing people in a fun social setting is totally different from just working together. Encourage them to bring family or significant others so you can meet them as well. Take time to get to know something new about as many team members as possible. This is one of the most important reasons to have holiday parties. One of the most powerful things you can do as a leader is to allow your team to know you personally. No, you don’t have to become their “buddy,” but you can be real, and a party is a perfect place for that. Seeing you having a good time and just being yourself can be extremely valuable to your team members. If you’re a company or organizational leader, it’s time to start planning your holiday parties. At Stokely Event Center in Tulsa, Oklahoma, we are the party place! Call us today at 918-600-4448 or click here to complete our online request form. If you’re just looking to plan an awesome night for family and friends, we’re definitely not leaving you out! We are your party place, too! Here are 4 more you’ve got to throw a holiday party or two or three! We all lead such busy lifestyles these days that it’s hard to find time to just hang out together. A holiday party is a perfect solution. Everyone will enjoy getting together, having fun, and catching up with friends and family. The holidays are a time for making memories. We all love getting together with friends and family. The times we spend celebrating together are so meaningful. A specially planned party can make the time just that much more memorable. Create a new tradition this year with a fun and exciting holiday party! Your family will love the relaxed environment you find at Stokely Event Center. They’ll want to come back year after year! Throw your holiday party at Stokely Event Center in Tulsa, Oklahoma. We are the party place! Our venue is second to none. We provide a great place, a fun atmosphere, and let you have a ball! We make it easy for you by connecting you with our network of DJ’s, caterers, bartenders, etc., to make your party a success. Call us today at 918-600-4448 or click here to complete our online request form.